Bungee Jumping Photo Courtesy of Lilly M, Wikimedia Commons. Bungee Jumping is a thrill seekers adventure that also allows for an investigation of energy concepts including Kinetic Energy, Gravitational Potential Energy and Elastic Potential Energy. Gravitational Energy (determined by height above the ground) is converted into Kinetic Energy until the slackness in the bungee cord is taken up. When the jumper reaches the end of his rope, there is an interplay between the three types of energy until Kinetic Energy reaches zero . In this simulation, a bungee jumper is dropped from a tower with a fixed length of bungee cord. The simulation operator can control the height of the tower, the stiffness of the bungee cord (determined by its spring constant k), the unstretched length of the bungee cord and the jumper's mass. The player buttons are the play/pause button, the rewind (to t=0) button and the reset button (resets all parameters to initial values). The operator may optionally display the forces acting on the jumper and a plot of the g-forces versus time. Note that the simulation measures the altitude in terms of the location of his feet, thus he hits the ground if his feet get within his 1.7m of height to the ground. When trying for a minimum drop from a platform set for h = 10 m, the jumber will hit the ground. The impact is represented by a red cross symbol blocking our view of the "accident". Start by setting the platform hieght to its minimum (h=10m), the spring constant of the bungee cord to its stiffest setting (k=200 N/m), the length of the bungee cord to its minimum (Lo=5m) and the jumper's mass to its minimum (m=40kg). Through trial and error determine the minimum platform height needed for a "safe" jump. 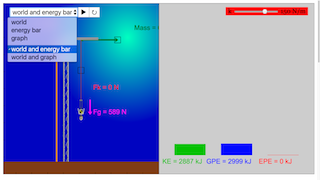 Play the simulation with these safe jump settings and watch the interplay between the various types of energy. 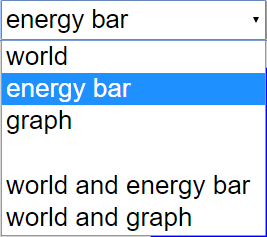 Does the total energy change? Are the g-forces experienced by the jumper reasonable, dangerous or even fatal? What kind of changes do you think the jump operator should make in order to accomodate a heavier jumper after a succesful jump by a lighter jumper? © 2018, Michael R. Gallis. 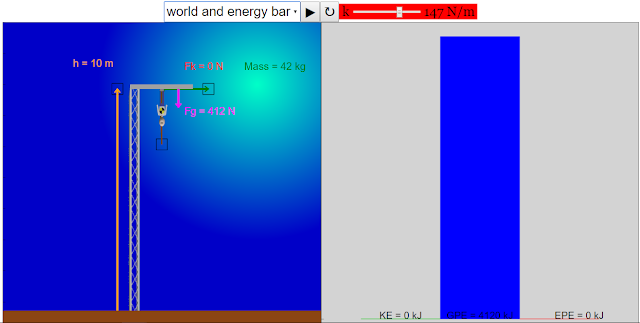 Toggling between the world-view Combo box will show the respective graphs. The first three options will select them in fullscreen. The last two options will combine the two views into one screen. Moving the slider will adjust the tension of the string in the Bungee Jump. While adjusting it to the right decreases the tension. Adjusts the height of the pole. Dragging the box will extend the length of the rope. Plays and Resets the simulation accordingly.